Are Pet Car Harnesses Safe? Recently, I've been hearing a lot about minor mishaps and accidents involving pets riding in cars on a few other pet blogs. I know there are many pet parents out there who don't secure their pets while they are driving. Hey - I'm guilty of doing it too. When Shiner was a puppy, she used to ride on my lap in the car. I know now that's a big no-no, but I've learned a lot since then. Today, I have a guest post from Paul E. Lee about pet car harnesses and pet car safety. I think it's an important topic that many of us can learn from. It is recommended that when placing a pet in a vehicle you restrain your pet using a safety harness; however the Center for Pet Safety (CPS) recently conducted a study and reported that none of the harnesses tested for the purpose of pet safety in a car effectively protected pets or humans. It is commonly stated that pets should never travel without being restrained to a car seat (usually through the use of a harness that connects to an average seatbelt) or being kept in a crate on the floor of the car. This is supposed to protect both the pets and the passengers in the vehicle in case of an accident. In a car crash, a pet can go flying and become seriously injured and/or injure a passenger. Humans, including adults, young children and infants, are strapped down and secured in a car, so why aren’t animals? The American Automobile Association (AAA) and Kurgo Dog Products conducted a survey in 2011 on the driving behaviors of pet owners who travel with their animals. The data showed that only 16% of pet owners actually restrain their dogs in their vehicles, 29% of pet owners say their dogs often distract them while they are driving and 17% of pet owners let pets sit in their laps while they drive. Keeping a dog restrained is better than no option at all. A harness minimizes distractions caused by pets so that the driver can keep their eyes and focus on the road. Additionally, dogs moving freely around the cabin of a vehicle may block the driver’s vision, accidentally hit the gear shifts and smaller animals may jump beneath the driver and obstruct the pedals. The harness also ensures that the dog safely remains in one place without jumping out of the window or putting their head out the window, which can actually be quite dangerous. Do your research before buying a car harness for your dog; read the safety reports and reviews. Never leave your pet alone in a hot car. The interior temperature of a vehicle can rise to dangerous levels in a matter of minutes. Do not let your dog keep its head out of the car’s window. Do not put your dog in the bed of the truck. 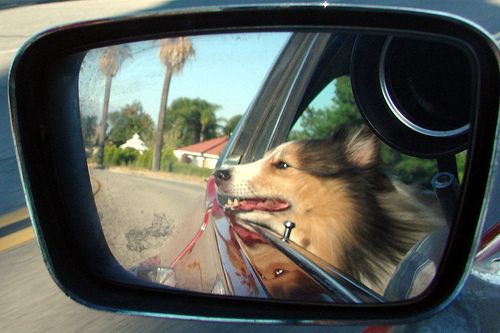 Keeping your dog in a crate in the car may help reduce motion sickness. Consider taking your pet to obedience training so they can learn the correct behavior for riding in the car. Check the laws in your state regarding restraining pets in the car or letting pets sit in your lap. You will get a ticket in New Jersey if you don’t restrain your pet, and in Arizona, Hawaii, Maine and Connecticut you will get a ticket if you let them sit in your lap in the car. The CPS is currently working with Subaru to design a testing standard for pet safety devices in vehicles. The CPS also urges government and lawmakers to educate themselves on the lack of safety standards among the harness devices before passing legislation requiring pet owners to use them while driving. About the Author: Paul E. Lee is the founding attorney of AA Accident Attorneys, a personal injury law firm in Newport Beach, California. He is a former police officer and Judge Pro Tempore for the Superior Court. He is passionate about pet safety and car safety and frequently blogs on each topic; you can read his blog here. Hope you'll do a follow up post on the standards being developed. I've read the reports about the failure of dog restraints, so I remain on the fence about them. I think they come in handy to keep your dog from crawling in your lap or jumping in the window. I don't think they are completely useless. Hopefully they can come up with something that is safe in case of an accident one of these days. Thanks for sharing this. We have our dogs harnessed in to keep them in their seats which helps increase everyones safety! We generally use crates which are secured. It works best for us. :) Hopefully they will develop harnesses that actually work in a crash for people who would like to go that route. I think crates are a good choice too. Very nice that you have them secured as well. Sometimes I ride in my crate and other times I use my new harness to be belted in. Ma is always worried about my safety. This was a great post so thank you for sharing it! Love the post! I have to say I personally do not like using car harnesses, and prefer crates. I find them safer, plus for my Joker who gets easily stressed on enviromental changes I find a crate great to prevent him to get too stressed durring a car ride from one place to the next. Plus if we happened to be in a situation that is just too much for him I can take him back to the car, cue him to his crate, and he is able to "cool" down again. I sure hope someone gets the safe part firgured out really soon! Me too Brian :) I'm sure it will happen some day. Great post, Ann. We spoke with the CPS folks at BlogPaws, and are glad that they are doing the hard work to really research this important issue! Great post! I really enjoyed reading this in depth review of pet car harnesses. I have a chihuahua and a very skinny medium sized dogs. I definitely have trouble finding the right harness. Thank you for stopping by Dara. Oh that sounds cool Remy! Shiner has the same kind of harness too. This is a hot button topic lately...I've never used one and don't plan on it, but I've never had a dog that acted up in the car...I'm very lucky in that all of mine like to curl up and nap in the cap, even Gizmo...Congrats to Shiner on her fashionista win today! I still have yet to use Shiner's harness in the car. I just don't have room to travel with her and the kids =/ Shiner is decent in the car, but one thing I don't like is how she is too quick to get out when I open the door. I guess a harness would help with that. And thank you! Great article. Yes Sleepy Pod does make a great round crate that you can harness in for cats and small dogs. Think I would still need a different type of harness for Gracie though. And here's another thought...I once witnessed a car accident at an intersection in front of my work location. The back door of one SUV car popped open upon impact, and two large breed dogs jumped out the back, apparently unharmed, and went running AWAY from the accident and down a four-lane road as fast as they could go. The driver of the car (and dog owner), was also unharmed but in a panic because her pets were running off down a very busy street and getting lost while she was forced to remain at the scene of a three car collision. See, I think it could go either way. Like, what if there was a fire and the dogs needed to escape but couldn't because they were strapped in? Then again there's the story you mention above. The same thing happened to my parents why my mom was pregnant with me. They got into a bad accident and the dog ran off. I guess my dad was pretty concerned about getting his dog back lol. He did get her back thankfully. And thankfully your Mom was ok with you! Yes! I hear it was a pretty bad accident. This is a grat subject, Ann. Cats should be restrained as well. Some of them will even appreciate it! Oh I completely agree there! I wrote about taking cats to the vet in the carrier not too long ago. Very interesting article and started M to thinking again. I don't like being in the PTU for any length of time, but seem to ride better if D is in the back seat with me and I can sit on his lap and look out the window. M has wondered if a harness would work for me. She knows she should keep me safe in case of an accident. Mostly we avoid the super highways when I'm in the car because they are so noisy and I don't like it. We much prefer the back roads if possible. Hey Mario - I think what's really important for cats is that they aren't running free in the car. If your D is making sure you aren't crawling on M and getting down there by those pedals while she's driving, then that's probably OK. A little harness might be OK just in case you were to jump out of the car or something. I think the back roads sound nice :) Probably much more nice stuff to look at too. Interesting post! I've read some articles on harnesses too and how they fail. I think it's like seatbelts for humans, it can be good but can also do damage. I don't restrain Titan, however it doesn't move all around either. He sits in the second row of sitting and generally won't move but to lay down or sit up. I know it may not be ideal for some but crating isn't an option and well I think a harness would do worse damage. I may be wrong though. Thanks for bringing it to light. I will be posting about my seat belt next Thursday. It is from Germany and passes their strict standards. It is now available in the US too. It really is a great and reliable seat belt! The ones here are a joke! Mine costs about $100, but it is worth it. Thank you for sharing these great tips. We use a variety of different options when traveling with our pets depending on the length of the trip. We find the harness is helpful, however our favorite is the kennel that snaps in place to the car seat base just like a baby seat. However, currently this is only available for smaller dogs and cats.